Additional research provided by Scott Matthews, Sally Mullikin, and Wiley J. Williams. Part 1: Introduction; Part 2: Roots of Civil Rights Activism in North Carolina; Part 3: Brown v. Board of Education and White Resistance to School Desegregation; Part 4: Integration Efforts in the Workplace, Sit-Ins, and Other Nonviolent Protests; Part 5: Forced School Desegregation and the Rise of the Black Power Movement; Part 6: Continued Civil Rights Battles in the State. See also: Black Panther Party; Charlotte Three; Congress of Racial Equality; "Death to the Klan" March; Fourteenth Amendment; Gays and Lesbians; Greensboro Sit-Ins; Ku Klux Klan; Lumbee Indians; National Association for the Advancement of Colored People; Pearsall Plan; Pupil Assignment Act; Radio Free Dixie; Student Nonviolent Coordinating Committee; Swann v. Charlotte-Mecklenburg Board of Education; Wilmington Ten; Women. In North Carolina and throughout the United States, African Americans have endured a long, turbulent, and sometimes violent struggle for social, political, and economic equality and justice. Segregation, born of slavery and descended from the black codes of the pre-Civil War South, was legal in the state from its embodiment in the North Carolina Constitution of 1868 to its undoing by the federal Civil Rights Act of 1964; de facto separation of the races and the legacy of racism have endured well beyond 1964. At practically every turn, the attempts of blacks to overcome an unjust status quo were met by white resistance and an unwillingness to change without the prodding of judicial authority or local activism. By the early 2000s, nevertheless, tremendous progress had been achieved. In North Carolina the civil rights movement extends from the heady days following emancipation when blacks first won political representation and the legal right to self-determination, through the struggles of the late nineteenth and early twentieth centuries when these initial gains were rolled back by white supremacy and the repressions of Jim Crow, to the small, grassroots movements of the 1940s and the landmark victories of the 1950s and 1960s. Even after the legal framework of segregation fell, however, its legacy was proved hard to dispel in practice, requiring regular interventions by the federal government, state legislators, and the courts. At every stage, African Americans led the way, not just at the federal and state level but also locally, one place and one issue at a time. Beginning in the 1960s and 1970s, Indians, women, gays and lesbians, and other groups struggled similarly for equal legal and social access in the state and the nation, with various levels of success. These movements continued through the final decades of the twentieth century, and in some regards they continue to the present day. David S. Cecelski, Along Freedom Road: Hyde County, North Carolina, and the Fate of Black Schools in the South (1994). William H. Chafe, Civilities and Civil Rights: Greensboro, North Carolina, and the Black Struggle for Freedom (1980). Jeffrey J. Crow, Paul D. Escott, and Flora J. Hatley, A History of African Americans in North Carolina (2002). Jane Elizabeth Dailey, Bryant Simon, and Glenda Elizabeth Gilmore, Jumpin' Jim Crow: Southern Politics from Civil War to Civil Rights (2000). Davison M. Douglas, Reading, Writing, and Race: The Desegregation of the Charlotte Schools (1995). John Egerton, Speak Now against the Day: The Generation before the Civil Rights Movement in the South (1994). Pamela Marie Emerson, A Newspaper Held Hostage: A Case Study of Terrorism and the Media (1989). Raymond Gavins, "Behind a Veil: Black North Carolinians in the Age of Jim Crow," in Paul D. Escott, ed., W. J. Cash and the Minds of the South (1992). Christina Greene, Our Separate Ways: Women and the Black Freedom Movement in Durham, North Carolina (2005). Robert Rodgers Korstad, Civil Rights Unionism: Tobacco Workers and the Struggle for Democracy in the Mid-Twentieth-Century South (2003). Waldo E. Martin Jr. and Patricia Sullivan, eds., Civil Rights in the United States (2000). Timothy B. Tyson, Blood Done Sign My Name: A True Story (2004). Tyson, Radio Free Dixie: Robert F. Williams and the Roots of Black Power (1999). Jones, Frank. 1946. 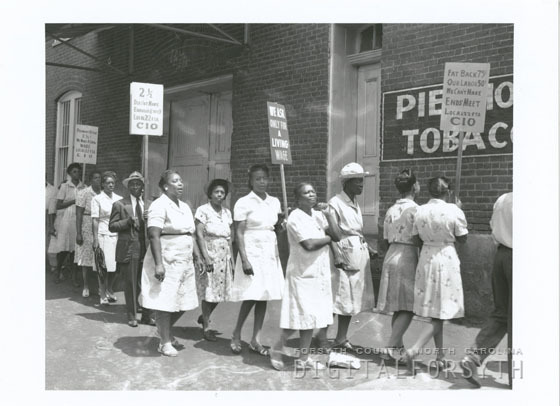 "Protest at Piedmont Leaf Tobacco Company, 1946." Forsyth County Public Library. Call no. FJ.18633. Online at Digital Forsyth: http://www.digitalforsyth.org/photos/1022. Accessed 11/21/2012. 1 January 2006 | Criner, Allyson C.; Matthews, Scott; Mullikin, Sally; Powell, William S. ; Williams, Wiley J.